“The state budget lays out the plan for achieving our shared values, and specifies the investments we’re making so Rhode Island families can prosper and our communities can thrive. The House budget proposal hits the mark on some fronts, while falling short in others”, said Rachel Flum, Executive Director of the Economic Progress Institute. 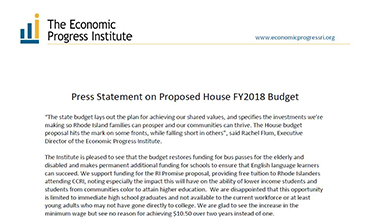 The Institute is pleased to see that the budget restores funding for bus passes for the elderly and disabled and makes permanent additional funding for schools to ensure that English language learners can succeed. We support funding for the RI Promise proposal, providing free tuition to Rhode Islanders attending CCRI, noting especially the impact this will have on the ability of lower income students and students from communities color to attain higher education. We are disappointed that this opportunity is limited to immediate high school graduates and not available to the current workforce or at least young adults who may not have gone directly to college. We are glad to see the increase in the minimum wage but see no reason for achieving $10.50 over two years instead of one. We are pleased that the budget made permanent the child care assistance exit limit allowing parents enrolled in the Child Care Assistance Program to increase their earnings and maintain their child care assistance. But we are concerned about the lack of investment in the child care sector and the repeal of the $1 million the Governor proposed to help increase provider reimbursement rates which are currently woefully inadequate. While the investment in education through the College Promise is limited to the next four years, the car tax phase out is enacted in its entirety over the next seven years. The decision to proceed with the phase out of the motor vehicle tax takes $26 million off the table in FY2018 that could be better used to meet pressing needs in Rhode Island, and in setting in motion a cut that will eventually reach $221 million (with inflation adjustment) annually, this decision turns a blind eye to looming federal budget cuts. We are very concerned that this decision reduces our ability to make smart spending choices needed to help Rhode Island prosper in the coming years. Regarding economic development tax breaks, the Institute believes it would be prudent to have the results of the statutorily required analysis of existing tax breaks before we continue down this policy road.